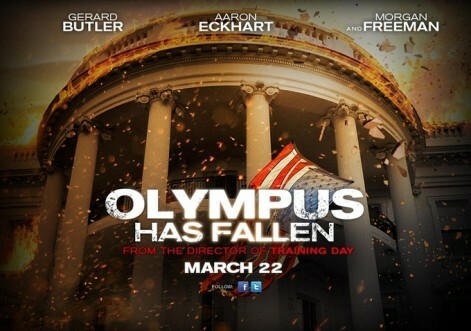 I just saw the trailer for Olympus Has Fallen and see that it opened strong this, its opening weekend, coming in #2 at the box office making over $30 million. Is it just me or has there been a surge in the number of movies being made about the White House coming under attack since President Barack Obama has taken office? The new G.I. Joe movie revolves around the West Wing possibly being blown to smithereens and I hear there’s a flick coming out this summer starring Jamie Foxx as President and guess what? His life and his White House residence is in danger of termination. Pop culture is often a great reflection of public opinion so it’s pretty obvious how Obama’s residency at 1600 Pennsylvania Avenue resonates within the American psyche. Film is just a sophisticated way to project our fears without having to cop to the reasons why those fears exist. It’s just art, right? Anyway watching the trailer reminded me of my funny connection to this flick. I had to dig in theHotness archives for this one, but it’s a good funny. Read on and find out how I’m linked to Olympus and get your Sunday Funny on!. I recently traveled to South Beach for a lil fun in the sun with my homeslice from Chicago. This was actually my first time back in Miami in four years and I was totally outta touch with what was poppin. Ingenious me decided not to get recommendations from trusted well-traveled friends or from online info ciphers like Traveling Diva or Club Planet. Oh no, I was going to be spontaneous and just ask folks once I got to Miami. As soon as I got off the plane I spotted a brother waiting to board that was dressed in this fly outfit and just looked like someone I would want to roll with. When I asked him what was poppin in MIA he just responded with a laugh and then said he’s from NYC and was catching a connecting flight back home from St. Croix and all he knew about Miami was that the Heat had a sucky season. Figures! So I make my way over to the Starbucks that’s located at the end of the terminal and as I get on line I see a very attractive man. He’s got that swagger and I catch his eye. As he walks by he doubles back and gets on line right behind me. Immediately I asked him with his chocolaty tanned skin what was hot in Miami. He looked at me and smiled and said he wasn’t really sure what was up, that he had been there for business and was now headed to New York City. Him: I come to Miami all the time for meetings and business and just get drinks at various hotels. You should try the lounge at the Shore Club or Delano. Me: Well I already know about those places. I’m from NYC. Hotel lounges are a given. Him: Well I don’t really do the club thing. You know I have bricks everywhere– South Beach, NYC, Malibu, Beverly Hills. Him: Yeah, homes. What part of New York are you from? Me: Oh so now Mr. Beverly Hills is spitting hiphop lyrics at me? I’m from the Bronx originally and I now live Uptown– Harlem, and I’ve never heard bricks used in that manner. Him: I may live in Beverly Hills, but I’m from the PJ’s. I know Harlem– the Pink Houses. Marcy in Brooklyn. I may work in “the industry,” but I’m from the hood. Me: Okay Biggie Smalls with your mansions and Benz’s giving ends to your friends. I get it. Him: (falls back laughing) Yo, you have jokes! Me: So now you live in Beverly Hills? The whitest, most xenophobic, most plastic place to live in this country? I don’t get it. Even if you work in the industry, you don’t have to live smack dab in it unless you are looking for validation. Him: Nah it’s not even like that. I genuinely like Beverly Hills. I can make any city my home because home is wherever I am. Me: Oh, so you I- Ching too and can spit 100 Laws of Power? Fascinating! So what do you do in the industry, Dr. Phil? Him: You’re killin me with the snaps. I work in film. I make movies. Him: Too many to name. Me: Uh ha, right. Well tell me “Mr. I Got Bricks” from coast to coast and too many movies to name, do you have a card? Him: No, I don’t carry cards. Me: No business cards! I see. Well do you at least have a name? Him: Well it was a pleasure speaking with you and when I get to New York I will talk to my friends and find out what’s poppin this weekend in South Beach and will reach out and let you know. (he takes my card) Okay, Ms. Hotness? Me: Cool. Have a good flight. I walk away thinking I’ve just wasted 20-minutes talking to some wannabe producer, hustling me with his jive flow. Thirty minutes later I’m retelling the story to my girl back at the hotel and it’s apparent that I’m still hot about losing much needed beach time by talking to some dude who didn’t even give up the digits! Finally at the end of my story I say to her, “and if things weren’t shady enough with this no business card having, can’t name a single film I’ve made poser, homey’s got the nerve to have some crazy, fake sounding Hollywoodesque last name. He couldn’t be Antoine Johnson or Thomas. Oh no this fool’s last name had to be exotic. Brace yourself now– “Fuqua”. Yep, Antoine Fuqua. Have you heard of any crazier shiz before? My friend’s mouth just dropped. Did you say Antoine Fuqua? Oh my god! Do you know who you were putting on blast? She then IMDB’d his name and well, all I have to say is I loved Training Day… ooops! I could see how you made that mistake though. He is pretty “common” and if he wasn’t naming any movies. But yeah, he has your card! I absolutely remember you telling me this! Reading it is even funnier! Great post!